AS a result of generous support from the Tasmanian Community Fund, the Bridgewater PCYC is delighted that Tasmania’s only black belt holder with current affiliation to both the International and Australian Federation’s of Brazilian jiu jitsu is now teaching at the Bridgewater PCYC. BRIGHTON’S Callum Fagg has been selected as a member of the Australian Junior Orienteering team. Callum is currently in Europe training for the event. The team will be competing at the Junior World Championships in Trento in Italy from July 5 to 12. Callum was selected for the national team from a series of outstanding results at the 2009 Australian Easter Orienteering Championships. Callum is one of three Tasmanians of the 12-member team (six boys and six girls). IF you have noticed a group of people walking around Bridgewater in late June, clipboards and cameras in hand then be assured that they were working on progress . This is the type of progress that will see positive change come to Bridgewater’s two commercial areas – Green Point and Cove Hill Shopping Centres and, the areas surrounding them. ST PAUL’S Catholic School has started delivering an exciting and innovative birth to four years program for its school community. This program is called Engaging the Learning Community (ETLC) The goal of the program is to create a community rich in learning and teaching so that it can provide opportunities to develop meaningful relationships with the three central protagonists in a child’s learning – the child, the family and the school. EARLIER this month Deputy Prime Minister, Julia Gillard, announced that schools in the Bridgewater area will receive a total of $6.5 million under the second round of the Federal Government’s Building the education revolution primary schools for the 21st century program. A WORKSHOP focusing on encouraging Brighton residents to think positively during difficult times was held at Pontville in May. The ‘Positive Thinking in Negative Times’ workshop was sponsored through Brighton Council’s community grants program. Rhea Ahlanu who is regional president of the Penguin Club at the workshop with Robyn Gray of Bridgewater, facilitator Leiz Moore and Mina Gericke of Honeywood. Twenty seven women participated in the workshop which was presented by Leiz Moore. It challenged participants to review the effects of stress and negativity in their lives and to keep life’s issues in perspective. Strategies for dealing with stress were discussed and the rules for being a human being as well as the ‘joy’ of stress were interesting concepts that the audience also considered. BRIGHTON Council has received yet more strong endorsement of its community programs winning this year’s ‘Delivering Excellence for our Communities Award’ presented by the Local Government of Tasmania. 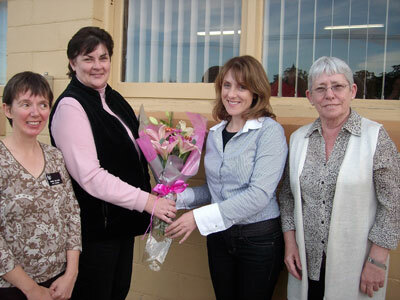 PREMIER David Bartlett recently hosted a morning tea to thank 100 of Tasmania’s volunteers as part of Volunteer Week. Mr Bartlett said each volunteer had been selected by his or her organisation for representation because their passion and commitment to volunteering stood out and was an inspiration to others. 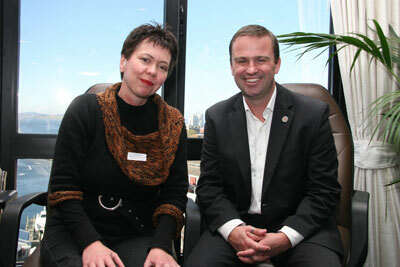 Premier David Bartlett with Bridgewater Library and Online Access Centre volunteer Val Cooke at the morning tea. “I have often said that though Tasmania is the smallest State, it has by far the biggest heart, and our rates of volunteering have consistently been above the national average,” Mr Bartlett said.